Untitled documentTanger Taste & Style Experience - FASHION, FOOD, FUN! Kids Kitchen Kreations Korner - Saturday & Sunday, 1 - 3 pmFun for the kids with our 'Kids Kitchen Kreations Korner' hosted by popular family-fun website/ e-newsletter, Macaroni Kids. Artisan Marketplace - Saturday & Sunday, 12noon - 5 pm"I Made It Market" marketplace with offer a wide-variety of local artisans selling their handcrafted merchandise such as flameworked glass wine stoppers, handmade gourmet dog treats, exotic wood wine butlers and cutting boards, unique ceramic housewares with modern aesthetics hand-thrown and fired, soy candles, as well as individual one-of-a-kind handcrafted jewelry. Plus, various gourmet specialty treats such as flavorful biscottis, macaroons, pizzelles, carmel/chocolate covered pretzels and marshmallows, and more! 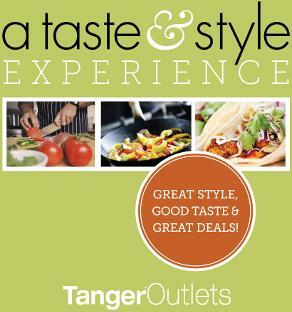 Spring "FASHION PLATE" Looks - Fashion Shows - 1:30pm & 4pm (Saturday)Check-out the latest looks this season from your favorite stores at Tanger Outlets. Stylish looks with the hottest color palettes and accessories from head-to-toe. 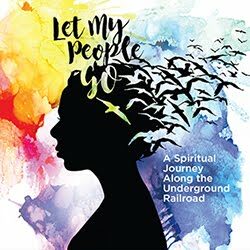 FLAVORFUL BOOK SELECTIONS - BARNES & NOBLE BOOKSELLERS - 12 pm - 5 pm (Saturday)Browse a variety of books showcasing our local flavors in Pittsburgh and Western PA, and some other "foodie" favorites. 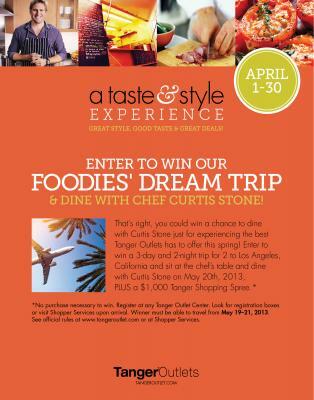 A Taste & Style Experience Gift. Great Style, Good Taste & Great Deals! Free Gift with Purchase from Curtis Stone & Tanger Outlets! Beginning April 1st 'Made to Measure' Melamine Spoons. 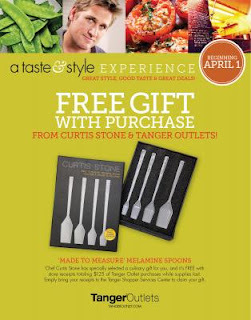 Chef Curtis Stone has specially selected a culinary gift for you, and it's FREE with store receipts totaling $125 of Tanger Outlet purchases. While supplies last. Simply bring your receipts to the Tanger Shopper Services Center to claim your gift.